Early Friday morning I woke up to waves about 5 minutes apart. I had had consistent and daily Braxton hicks since 16 weeks and had a couple of weeks of prodromal waves, but these felt different and I cautiously got excited that it might be my birthing time. After about 4 hours of practicing my breathing and hypnosis techniques, they completely fizzled out. I finally got up around 9 and went on a cinnamon roll hunt with my sister. I was frustrated as the day went on and I didn’t have any more waves- not even my normal Braxton hicks!! I was 41 weeks and was ready to have this baby! I went on a walk Friday afternoon and then put on the “Come OUT Baby” track and had a very frank conversation with my daughter about not being an October baby ? Nothing happened the rest of the evening and so I just rested. I watched the new Grey’s episodes and the new SVU episode and then laid on the couch with my husband (Matt) while he played his video game until about 11:30 pm. Went to bed feeling a little “off” but still no waves to speak of and was fully prepared to wake up the next morning still pregnant. At 12:30 am I woke up with pressure on my tailbone and pubic bone and new waves that were very unlike the other waves. They were very close together and I had leaking waters with each wave. After about 30 minutes, I told Matt (who had conveniently JUST come to bed from his game) that he needed to start getting stuff ready for the midwives and to call my midwife Lisa. My husband was very calm and pragmatic about the whole thing and was trying to get me to time my waves but they were already at a minute in length and 1-2 minutes apart. I put Easy First Stage track on at some point – not knowing at that point that I had really skipped over early birthing! About an hour later I told Matt that he was going to end up catching the baby! I could feel the powerful stretching and my body had begun to push with each birthing wave. I had planned on breathing baby down but there was no stopping the way my body bore down with each pressure wave … I just surrendered to it and focused on breathing through the wave and the way my muscles were pushing her through my body. I saw a text from my midwife pop up at 2:17 am that she was on her way and I just looked back at Matt and told him she wasn’t going to make it in time. I felt so calm and peaceful! I completely trusted my body and knew that my body was designed for this very moment. The midwife’s assistant walked through our bathroom door literally just in time to catch our daughter and lay her up on my chest. It was such an amazing moment!! 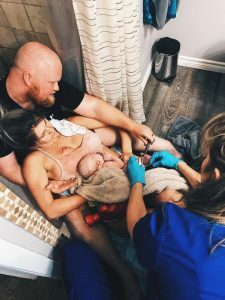 The midwife arrived maybe 5-10 minutes later and continued apologizing for it being the first birth she had ever missed! Matt and I are still laughing about it ? Although I didn’t get to use the tracks or my switch the way I had envisioned (Easy First Stage stayed on the whole time!) I did use my hypno-anesthesia and envisioned a beautiful warm orange blanket being wrapped around me while the waves were intense. I also deeply credit the Bubble of Peace and all the Joyful Pregnancy Affirmations for how calm and collected I was even though I was thrown into transformation time basically just 30 minutes after waking up. 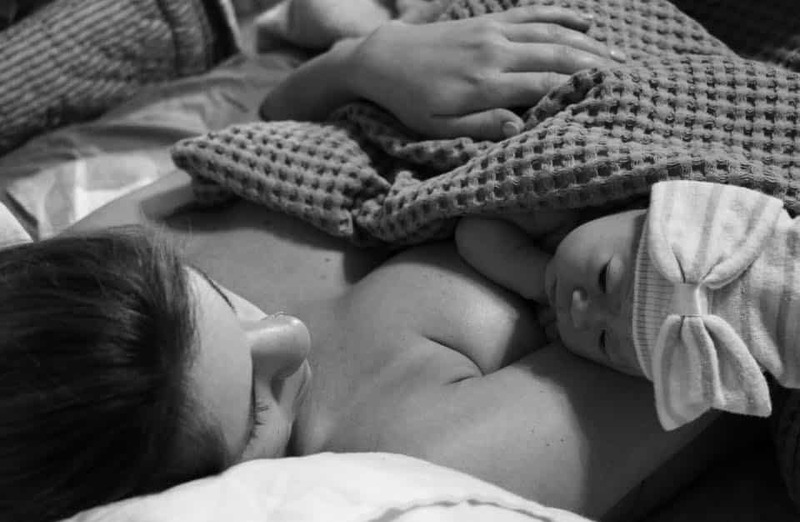 My entire birthing time and giving birth process took a total of 2 hours- by far the most incredible and empowering experience of my life.